This is a 2002 book by the pastor of a large Presbyterian church in San Antonio and former professor at Fuller Seminary. It is a defense of the blended worship module with a strong kinship to the convergence movement. 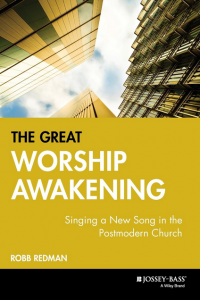 The sub-title is: “Singing a new song in the postmodern church.” Redman always quotes Robert Webber and Sally Morgenthaler with great approval. This is an example of the defense of diversity in music (otherwise called worship) based on the (I think wrong) conclusion that culture is only partly ill-affected by sin and therefore morally neutral (at least for the most part) and also on the conclusion that church history shows that the church has always embraced diversity uncritically. Of course, when you can use any kind of church as your example with almost no critical thing to say of any church or movement in history, you can prove almost anything from history! As is typical, anything having to do with a conservative or traditional church service receives all the common invectives such as shrill, cranky, or even “grouse” (which could mean a bird with a plump body, or someone who grumbles).